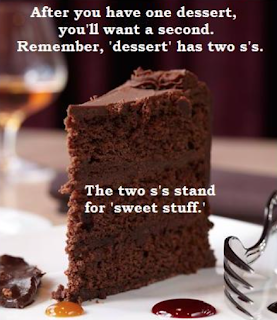 The teacher gave us a clue how to remember differences between two words desert and dessert. Madelyn asked students how many pieces of cake do we usually take. Michail answered two and Madelyn replied "remember that you need to use two letter s in this word”. I noticed that if I took one pieces of cake before, for remembering this word I would change my habit. Joke helps us to remember, this is a fact.